FOODIE: Dress Up Your Sandwich with Fancy Mayo! As a person who makes most of her food at home, you can imagine that a turkey sandwich eventually gets pretty boring. Mayo, mustard, a slice of cheese and some avocado can only go so far. So a few months ago I decided to get crazy with the cheese whiz. OK, not really the cheese whiz, but definitely my mayonnaise. I smeared the newly invented mayo on my bread and grilled the combination turkey sandwich on my roomie’s George Forman (those things are GENIUS!) and smiled all the way back to my desk. 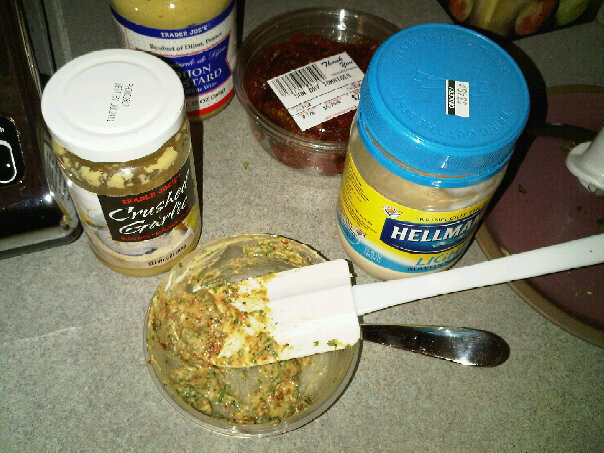 I’m sure I’ll come up with more mayo combinations as time passes and, hey, have you seen those fancy mayo’s in the grocery store? *guffaw + judgement face* Homemade is always better, just ask Curren$y. Are you making something in your kitchen that’s awesome? We want to know! Leave the recipe in a comment below.